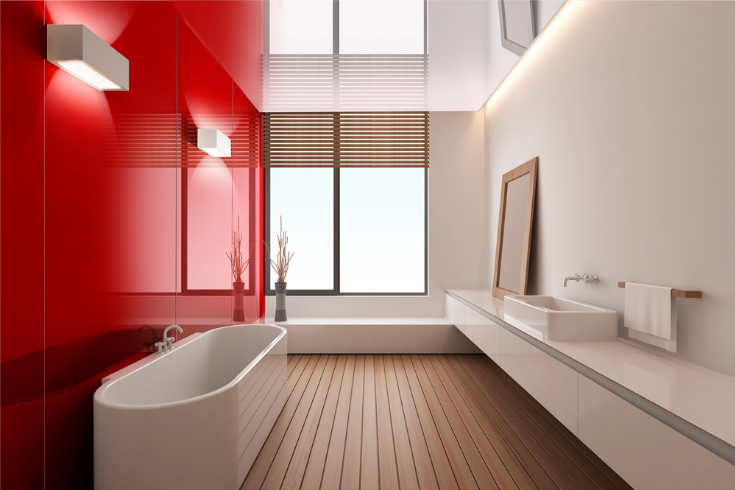 If you’re an architect, designer, custom builder or homeowner you may be familiar with the concept of coloring the reverse side of a piece of glass to get a clean, contemporary and easy to clean wall surface, but you may not have heard about two alternative (and less expensive) products high gloss acrylic walls (see the cool red pic above) and glossy laminated shower wall panels (see the fun blue pic below). While all of these materials can make a dramatic impact for a backsplash or shower in a home (or feature wall or boardroom application in an office) they each have distinct advantages which drive your decision on which is best for your home. In this article we’ll dig into all 3 option so you can sift through and find the best one for you. Let’s take a peak at these materials and get the ‘low-down’ on their relative advantages and disadvantages. Back painted glass is simply glass (which can be standard, low iron or tempered) which has been painted on the reverse side to create color. It can be heavy and fragile – but is very cool to look at. 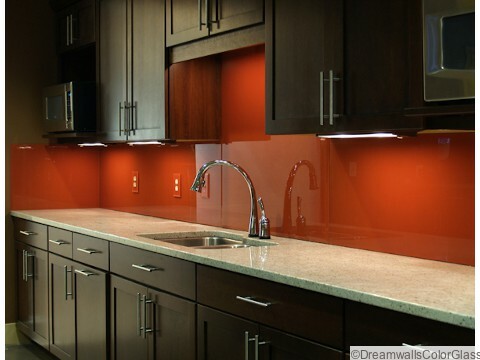 What are high gloss acrylic wall panels? 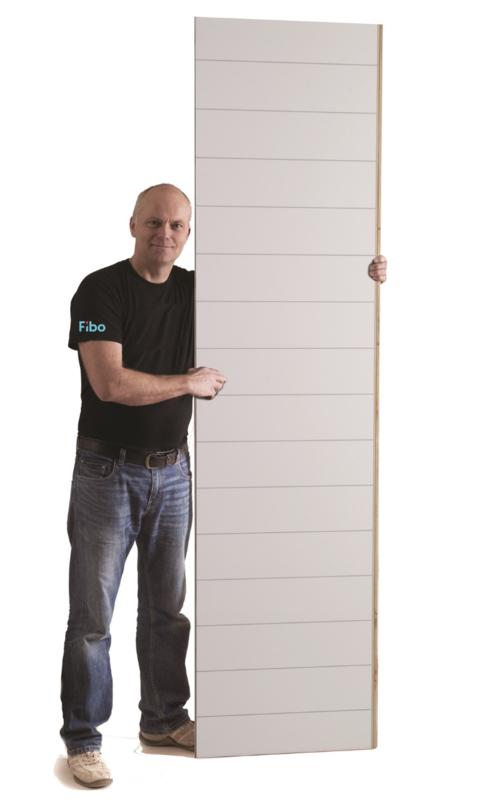 What are laminated wall panels? Laminated wall panels are 3/8″ thick and are made in 2′ x 8′ x 3/8″ sections which click, lock and seal together. They come in various patterns (both with and without joints) and can be installed by one person. 1 – Matching a specific color choice – This product can be color coordinated to match a specific décor and is also available in metalized paint options. The options can be important in a custom-matching project. 2 – Laminated glass can create a different look on 2 sides of a wall – With a laminated back painted glass you can have a color on one side and an etched or patterned glass on the other side. 3 – Tempered for high temperature areas – If you’re looking for a backsplash behind a stove or a fireplace tempered back painted glass will meet the need. High gloss acrylic panels – while not as well known as back painted glass – have some very strong advantages. 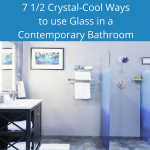 2 – Easier to work with and install –This material can be cut or drilled with common woodworking tools and is lighter than back painted glass – making it easier to install by a DIY’er or professional contractor. 3 – Higher strength – High gloss acrylic panels are 25 times stronger than glass and safer to work with. 4 – Flexibility – If you have a slightly curved wall these panels can be formed over this surface. 1 – MUCH lower cost – Laminated wall panels are about 1/2 the cost of the high gloss acrylic panels mentioned above and 1/3 of the cost of back painted glass. From a cost standpoint they blow the other 2 options away! 2 – Easier to work with an install – Since these panels come in 2′ x 8′ sections and only weigh 26 pounds they can be installed with one person (which neither of the 2 other options can touch) and are far simpler to install (they simply click, lock and seal together). 3 – Design options – Unlike the other 2 products which have smooth and flat surfaces – laminated wall panels can have gloss ’tile looks.’ However they are still simple to clean because these ‘faux-grout joints are made of laminate, not grout. 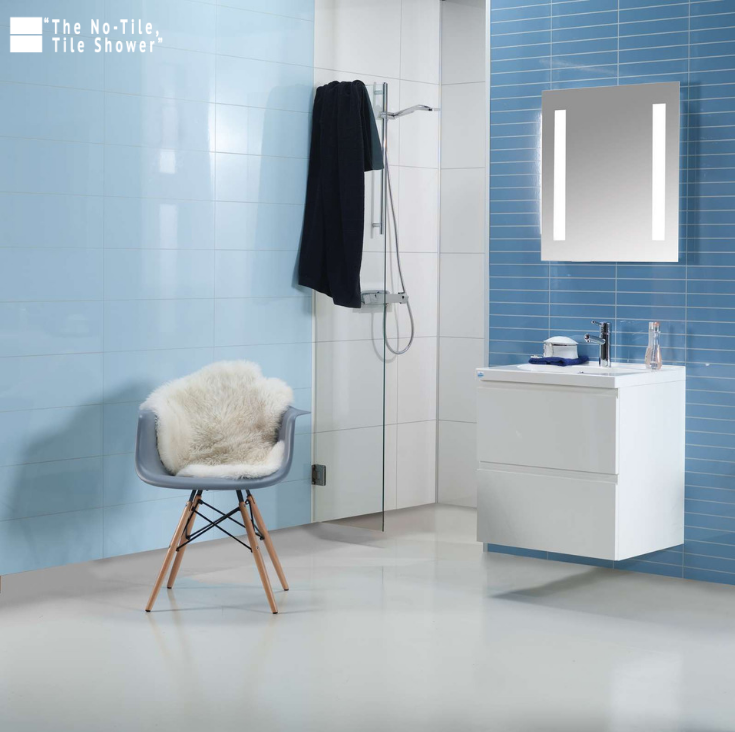 4 – Sizing flexibility – Since the panels can be cut with common woodworking equipment you can do either a standard or custom sized shower or backsplash without needing special cuts being done at the factory. Which of these materials would be best for your project? Please comment below with your questions or call us at the numbers below if you’d like wholesale direct pricing . 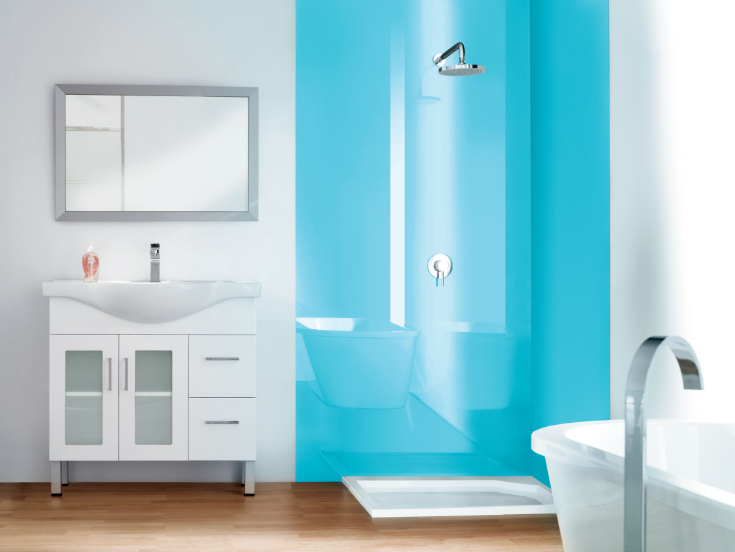 If you’re looking for more information or an estimate on high gloss walls call The Bath Doctor of Cleveland (216-531-6085) or Columbus (614-252-7294).For nationwide direct product sales on these (and other) shower wall surrounds, bases and more Innovate Building Solutions (877-668-5888). For complete bathroom remodeling contact Cleveland Design & Remodeling (216-658-1270). We recommend using a neutral cure silicone and double sided tape to adhere the high gloss walls to a backer board system. what are the best ways to attach the back painted acrylic product to a vertical surface? Jessica – there are lines of high gloss acrylic panels which can be applied to casework in an office kitchen. Let us know if we can help further. I am considering using acrylic for the casework in an office kitchen. Would high gloss acrylic be appropriate for this application? or is it best used applied directly to walls? Doreen – yes and no. For electric cooktops the answer is yes. For gas cooktops the answer is no for the acrylic tops. We do offer a line an aluminum with virtually the same look you can use as well though. Give us a call we’d love to help you out. Can acrylic be installed behind a cooktop? Hi – looking to install a backpainted acrylic panel behind a freestanding tub. Can you tell me if you have a Dallas-area supplier/installer? Thank you! Acrylic panels will generally only scratch if someone is using the wrong types of cleaners (i.e. abrasive products). Do the high gloss acrylic panels scratch like most acrylic does? Glass is not likely to scratch at all. How do they compare in this respect? These high gloss acrylic sheets are not the same as “acrylic sheets.” This material has a solid back so you won’t see the neutral cure silicone and double sided tape which holds them in place. In addition they use an “optical grade acrylic” which gives it it’s high sheen. They are more costly than the acrylic sheets you mentioned here – but well worth it for their longevity and dramatic looks. Call our office at 888-668-5888 if we can help you further. Sooooo glad that I found this page. I am in the process of opening a new store location and I want one of the entire walls to have this back painted effect–using acrylic. I’m going with acrylic for the sake of safety, flexibility, and maintenance. The store is In an entirely different state than I am, so I need as least problems as possible. I’ve found the acrylic sheets for a pretty decent price 4ftx10ft 6mm for about $250. I just wonder will the silicone show through once mounted? Should we drill holes to hold the panels or silicone glue? Thanks Kathleen for your comment. I’m glad you found this article to be useful for you to use in talking to a client about high gloss walls vs. back painted glass. You make a good &objective argument and with it, an outline for presentation of the decision to a client. Thanks for sharing!